Bafana Dludla, or Fisto as he is known, is the third of four brothers and the only one in the family with albinism. But his skin condition has never made him feel less important. Dludla (32) says his positive outlook on life has more to do with how people close to him have treated him since he was a child growing up in Enxiweni Section in Tembisa, Johannesburg. 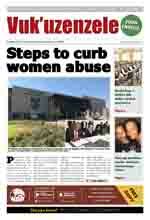 The treatment Bafana Dludla received from his parents, family and community members made him what he is today. Dludla is lively, talkative, confident and street-wise. From the way he dresses, walks and talks, you can see that he is from 'ekasi' or a township. His stylish, short black leather jacket, cream trousers, matching sneakers and a cap, clearly show that Dludla has a vibe. Despite his skin condition, called albinism, Dludla has a lot to be proud of. 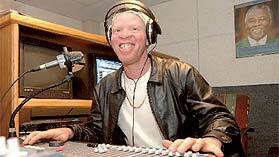 When he appeared on TV dancing on the then famous music programme Lapologa in the late 1980s, people told him he was the first person with albinism to have done so. In 2002, he was a dancer for the well-known group Iph'intombi. He has also acted in an educational drama Kenako on SABC2. Today, Dludla is commonly known as DJ Fisto in Tembisa. He loves house music. In 1999, he bought equipment and started playing music at clubs, weddings, parties and street bashes. He now plays for the Voice of Tembisa, a local community radio station and is working on his first house album. He is also training a group of young dancers in the township. Dludla speaks highly of his community and family, including his mother who passed away in 1983. "They never made me feel that I was different from other children. The only time I felt different was when I was about 12 years old. Other children refused to touch me or to share things with me and called me 'lekgowa' (white person)," he said. "I used to be very angry, but as I grew older, everyone loved me. At school the girls liked me and I had girlfriends. My brothers would fight anyone who called me names. "My mother told me a lot about my skin condition and prepared me to face discrimination." He now has a girlfriend and says he would love to marry her "if God wants it." Dludla attended primary and high school in Tembisa, but he couldn't finish matric because of problems with his eyesight. He has a 13-year-old daughter who lives with her mother. OUR LEGAL SYSTEM: HOW DO OUR COURTS WORK?